I am very lucky to be working with a great bunch of people who, in my role as Industrial and Protective Apparel Consultant, require me to travel quite extensively. Yesterday I was having a drink in a busy watering hole in a city popular for tourism, when in came a group of about a dozen bikers on a ride out from a Harley Davidson rally that was being held somewhere nearby. In this group were both men and women, all seriously into their chosen sport, and if you are familiar with the protocol you will know that the different chapters of particular clubs will wear their colours like a uniform on the outside of a leather waistcoat, worn over their jacket. The idea of course is that they are instantly recognisable as being from a certain club with only the chapter name being the difference. Now, where I am currently, it has been quite warm so I think we can excuse some of these guys for not wearing their ‘uniform’ and just wearing their T-shirts (while off the bike) which were black, and all showing the name of their club. However, one woman stood out from the rest because what she was wearing was different. Her T-shirt was fluorescent pink. Not just pink, but the brightest, most vivid pink you will have seen. High-vis pink, even. I sat and enjoyed the revelry for an hour or so, but I was pondering on one thing. Why was she not wearing the same as the other women in the group? I am a bit of a creature of habit and although I don’t go to the lengths of having a wardrobe full of the same shirt and suit for different days of the week, I do possess an undeterminable number of identical black socks (which never need to be paired), several pairs of the same blue work jeans, and lots of black T-shirts. I understand uniformity, so why had someone whose lifestyle dictated a certain dress code chosen to be so different on this occasion? The answer is of course that she wanted to be seen. For some reason, on this day she wanted or needed to stand out from the blackness of ‘bikerdom’. She was highly visible. While the lady in pink had her own reasons for standing out from the crowd, there are of course sound reasons based in safety for employees to stand out as they go about their jobs. High visibility garments are commonly used by construction and maintenance workers throughout Europe, on motorways and roads, rail networks, airports, docks and harbours, and also by emergency services and security personnel. They are also worn in non professional activities, by children walking to school, cyclists and aforementioned motorcyclists, plus participants in sporting activities such as running or horse riding. 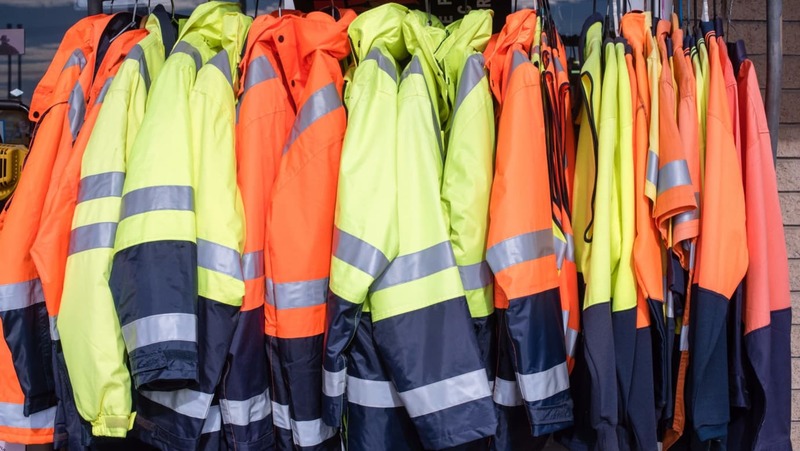 In these days of compliance we increasingly see the use of high visibility clothing in the workplace, but are we making the right conscious decisions about what we buy and use? A few years ago when I visited the offices of a leading US work clothing manufacturer, I was surprised to see that the use of high-vis apparel was not as extensive at the time as it was in Europe. The perception there was that, with the sheer amount of high-vis being worn by UK industries of all types when in the dangerous world of the public, it was difficult to differentiate between a police officer and a refuse collector. I had to admit I could kind of see their point; however, I did respond with what I think was the real issue. Quality. In its infancy, the availability of innovative high-vis styles was something of a problem, but as with all things, once the legislation dictating its use was here to stay the floodgates were opened - sadly, to more rubbish, in my view. Now don’t get me wrong - the need for economic products, especially when they are included in a requirement by law, has its place in any market. But when you actually take stock of what wholesale importation of cheap quality, low priced products does to a market, you end up having to answer a number of questions. It’s true to say that there are many great products out there that ‘meet the standard’, but remember the standard is a minimum requirement, and in the case of Class 1 visibility (we’ll see the differences later), which is the lowest performing, the functionality of a product can actually be quite poor. Surely this is a case for exceeding the minimum requirement? The decision is yours. Will the cost of this product dictate its safety potential? In other words does it meet the standards? Is it actually legal and fit for purpose? Will this product prove to be cost effective? What is the actual cost of ownership when looking at wear life? Is buying cheap really a saving? The problem is that I don’t think that many employers or employees alike actually know, understand, or are willing to investigate these issues or the options. And, like it or not, the increasingly strict HSE legislation is here to stay. I think that we first need to know a little about the standards. So forgive me - here comes the necessary, but not so interesting bit. The European Standard provides a solution that enables the major issues to be resolved. The performance of the conspicuous materials to be used in high visibility clothing is specified, together with minimum areas and placement of the materials. Essentially, the standard tells us how visible we need to be in differing scenarios, and how well the garment has to perform. High visibility, or ‘conspicuity’ as it is referred to, is enhanced by high contrast between the clothing and the ambient background against which it is seen, and the larger areas of the conspicuous materials being used, the greater the visibility. It tells us the amount of difference that we have to achieve in order to be conspicuous or highly visible against most backgrounds found in urban and rural situations in daylight. However, users should consider the prevailing ambient background in which protection is required and select the colour that provides the preferred contrast. Higher levels of reflectivity (retroreflecting) provide greater contrast and visibility of warning clothing when seen in headlights during darkness. When greater conspicuity is required the higher level of retroreflecting material should be used. Basically, the more visible we need to be the more reflective and bright our clothing needs to be. Three classes of warning clothing are specified. While the area comprising clothing is obviously dictated by the type of clothing and also the size of the wearer, it should be noted that Class 3 clothing offers greater conspicuity against most urban and rural backgrounds than Class 2 garments, which in turn are significantly superior to Class 1 clothing. Any evaluation of what should be worn should be based on the legal requirement and a risk assessment of the condition in which the warning clothing is to be used. This will involve consideration of the requirements necessary for an observer to understand that a high-vis wearer is present. The observer needs both to perceive and to recognise the wearer, and then to decide to take appropriate avoidance action. Remember: the wearing of a high visibility garment does not guarantee that the wearer will be visible under all conditions. As with any safety item, we should take advice before purchase decisions are made - and importantly, we should undergo the appropriate consultation between employer and employees. What is needed? Which would be more comfortable? How does that fit with the regulations? This is not just recommended, but actually cited in the EN certification documents. It is also important to find out where the ownership of responsibility lies to maintain the standards. How often do we see a filthy uniform rendered unfit for purpose by its condition? Personally, if I was in danger at work and needed to be visible, I’d make sure that I was at all times. The EN standard does, however, refer to the level of acceptable deterioration of the product from wear, washing, sweating or fading, for example. Again, please remember that any standard is the minimum requirement considered to be either safe or legal. Something that surprised me was the difference in performance between cheaply made, low end products and those supplied by professional PPE suppliers. By professional I really do mean those companies who employ experts in their design and testing, and spend money on developing and upgrading the quality of their products. Conversely, when I say professional I do not mean manufacturers who see an opportunity to supply the cheapest materials at low cost - even though they may meet the basic standard. I was lucky enough to have been shown first hand, and taken through the actions of a fabric development specialist. I have seen the differences in fading between varying quality fabrics, the different level of reflection from the glass beading in reflective stripes, the durability against abrasion and the resistance to dirt. I have seen the difference in the amount of light reflected back from a fluorescent jacket and compared the results between quality and cheaply manufactured items. You don’t need to do that - there are experts and specialists whose job it is to take this seriously and who will happily advise you. The UK market has been flooded with poor quality high-vis workwear. We all know what I’m talking about - you cannot get away from the ubiquitous high-vis yellow/green vest! You see them draped over shovels, or tied to the end of a ladder on a van roof - but that’s the point. When you buy an 80p vest should you really expect it to protect you from hazards? Maybe this is why they litter the central reservations of our motorways, are regarded as worthless and treated with no respect - a poor indictment of a tool that is supposed to help prevent accidents. I have a friend who ran a once successful manufacturing company making good quality high-vis garments for all industries in the UK. They were subsequently forced to move their business offshore, and in that instance the products provided no protection - against unemployment to the people who lost their jobs at the site in Britain. The company eventually moved out of that business, which was a loss to UK industry. The reason was that the demand for cheap, low quality products which barely met the standards was feeding a market already confused by the standards and requirements. It has to be said that there are now some very successful, quality manufacturers of these products, and because styles have developed the chance of a police officer being mistaken for a refuse collector is now much less likely. But given the difficulties there are in accessing the correct information on the standards you need to meet, making good purchasing choices can be difficult, and unless the sellers educate their customers in performance differences there will always be confusion. I’ve skirted around going into too many details, but here are a few you may find helpful. Do the garments conform to the EN471 Standard? Can this be verified? Is there a CE mark on the label? Can this be proven to be the accepted standard mark or is it an unregulated manufacturers mark? Are there any standards which the clothing should meet? ?HV clothing should be manufactured to a recognised standard. The British Standard for high visibility warning clothing is BS EN 471. This is a harmonised European standard produced with the legal requirements for PPE in mind. The first letter (X) indicates the class of conspicuity. As previously mentioned, this depends on the minimum area of conspicuous materials that are incorporated into the clothing, with Class 3 being the best and Class 1 the lowest; the second letter (Y) indicates the retroreflection performance with Class 2 being more visible than Class 1 when seen in headlights during darkness. The standard gives specifications for coveralls, jackets, waistcoats, tabards, trousers and harnesses. ?From July 1995, new clothing must be CE marked to show it meets the new European rules on the manufacture of PPE. Remember, the CE mark only means that the clothing meets the standard. It does not mean it can be used in all situations. HV clothing must be suitable for the actual conditions of use. Even with a brief roundup of standards, it’s clear there are a dizzying array of variables to consider when choosing the correct reflective clothing to suit the job. My counsel is to seek expert guidance, test some competitive products and gather all the information you can prior to purchase. This can be done easily. On the subject of safety clothing - whether that’s high-vis, flame resistant, or something designed to protect workers’ hands or face - always buy something that you are confident will protect your workers most effectively, or even save their life. As managers responsible for the procurement of PPE, saving a life is a preoccupation you need to have before the event, rather than when it’s a devastating reality. You can weigh up the price of PPE, but you can’t attach monetary value to a life - so it’s worth trying to understand the regulations, and not merely go through the motions just to barely comply, or worse, ignore them. If the only thing that you do today is to chose to wear a form of clothing that dramatically reduces the risk of injuries at work caused by a force outside of your control - then you have done the right thing. If you do nothing and refuse to accept the risk or the regulation, your workforce deserves better. ? Paul Toplis is an industry professional with 25 years of uniform industry experience. Originally in the design field, Paul crossed the lines of sales and training while working for a textile CAD software company. This led to the beginning of his consultancy career, a manufacturing business and culminating in his involvement in large volume industrial apparel industry. Having designed, advised, trained and trouble-shot for the likes of Burberry, Pringle, Disney, Marks & Spencer, JordanF1, Williams and Alexandra PLC, he is currently supporting VF Imagewear in the marketing of their Bulwark Protective and Red Kap Industrial apparel brands. His Independence and VF’s attitude of providing the end user with as much knowledge as possible allows Paul to give open and qualified advice. Although a UK resident Paul travels extensively in the Middle East and North Africa, and assists companies around the world to make these educated choices in their work-based apparel purchases. You can contact Paul on +44 1159 335858.